Eitarō Iwama, pilot, and Kiyoshi  Yamazaki, navigator, survived four sorties as members of Japan's Kamikaze Special Attack Corps. They flew together in a Type 99 Carrier Dive Bomber (Allied code name of Val) toward Okinawa from Kokubu No. 2 Air Base in Kagoshima Prefecture, but each suicide mission was aborted before they reached any enemy ships. Sakuji Horikoshi worked many years as an Asahi Shimbun newspaper reporter and manager, and he has written six other books on various subjects. He first met Iwama more than 40 years ago when he worked as a political journalist for Asahi Shimbun and Iwama as Section Chief for the Japanese Department of Education, but he did not get much of Iwama's story at that time. Now 65 years after the events he tells the story of the four unsuccessful suicide sorties of Iwama and Yamazaki. He bases the book mainly on personal interviews of these two crewmen but also books on the subject  and visits to the locations of two former air bases where they were at during the war. He had great difficulty in locating Yamazaki living in Nagano Prefecture, since he had changed his family name to Kamijo when he married after the war's end. Horikoshi tells about the four suicide missions of Iwama and Yamazaki from the third-person point of view with a few scattered quotations, so the story lacks immediacy and directness. The distinct personalities of Iwama and Yamazaki do not really come out in this book. Horikoshi also at times mentions that the two of them have slightly different accounts of what happened and when, which can be considered natural based on the number of years that have passed since the events took place. The book includes background information in various places, but sometimes this slows down and detracts from the main narrative. The first section in the book includes four wartime photos and five recent photos of the sites of Kokubu No. 2 Air Base and an Army air base where Iwama and Yamazaki made a forced landing. This paragraph summarizes what happened during the four sorties of Iwama and Yamazaki. There are some inconsistencies in the dates provided to the author, so the dates mentioned in this paragraph may not be exact. On April 6, 1945, Iwama and Yamazaki flew their Type 99 Carrier Dive Bomber as part of the 2nd Seitō Squadron from Hyakurihara Air Base in Ibaraki Prefecture to Kokubu No. 2 Air Base, which was being used for sorties by kamikaze pilots since March 18. On April 17, they took off for the first time from Kokubu No. 2 Base, but they had to return to base when their aircraft developed engine problems near the southern tip of the Japanese mainland in Kagoshima Prefecture. On April 21 or 22, their sortie was delayed due to engine problems, and when they finally took off they could not find the other planes in their squadron due to clouds and their plane's engine again started to make loud noises, so they returned to base again. Their third sortie was scheduled for one day in the middle of May, but their squadron's mission was cancelled when a Zero fighter taking off crashed into some other planes ready to take off and caused extensive damage. In late May or early June, they sortied for the final time from Kokubu No. 2 Air Base toward Okinawa and made it to the island of Tokunoshima, about 130 kilometers north of Okinawa, when their engine started to have problems. They managed to land safely at the Army's Tokunoshima Air Base even though they could not successfully release their bomb prior to landing and the runway had many holes from prior aerial bombardments. The wet runway from the rainy season helped stop their plane quickly, but it also damaged the rear wheel when landing. Iwama and Yamazaki were stranded about two weeks on Tokunoshima before their plane could be repaired. They left early in the morning to return to Kokubu No. 2 Air Base and did not encounter any enemy fighters on their return to the mainland. However, due to the low amount of fuel and the rough running of the engine, they made a forced landing at the Army's Bansei Air Base in Kagoshima Prefecture, where several Army tokkō (special attack) planes were about ready to take off on a suicide mission toward Okinawa. The next day they were taken by truck to a train station in Kagoshima City, where they took a train back to Kokubu. However, the kamikaze squadrons from Hyakurihara Air Group had already all departed toward Okinawa, so the officers at Kokubu No. 2 Air Base asked them to return to Hyakurihara. They were not able to use the plane they had abandoned at Bansei Air Base, so they borrowed a plane at Kokubu that belonged to the Nagoya Air Group. They flew to Nagoya and then took trains back to Hyakurihara. The war ended while they still were at Hyakurihara. Two chapters somewhat abruptly interrupt the chronological narrative of the wartime service of Iwama and Yamazaki. 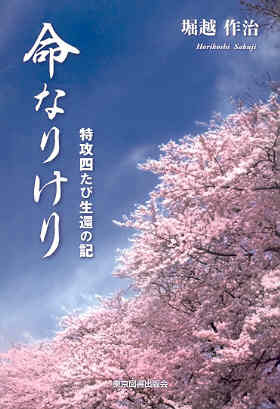 Each one briefly tells the story of a kamikaze pilot who also sortied from Kokubu No. 2 Air Base. Chapter 11 covers the story of Shigeyoshi Hamazono, who took off from Kokubu as part of the 1st Seito Squadron from Hyakurihara Air Group on April 6, 1945. 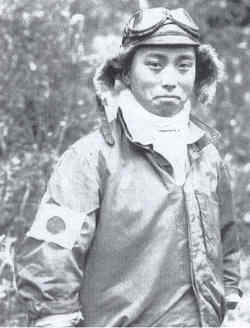 He is featured in the 2007 documentary entitled Wings of Defeat, and his fascinating wartime experiences are told in detail in the book Zerosen ni kaketa otoko: Moto tokkoutaiin - Hamazono Shigeyoshi monogatari (Man who soared in Zero fighter: Story of former special attack corps member - Shigeyoshi Hamazono) (2003). He barely managed to survive his sortie on April 6 by escaping from enemy fighters that tried to shoot down his aircraft. Chapter 12 tells the story about Masaaki Tokitō, who made a sortie from Kokubu No. 2 Air Base also on April 6, 1945, as part of the 1st Kusanagi Squadron from Nagoya Air Group. His parents, who lived in a nearby town, traveled to Kokubu No. 2 Air Base and saw their son just before his departure to Okinawa. He greeted them smiling as usual and said, "Thank you, Father, Mother, look after yourselves. I have no regrets. I go gladly." He then took off and never returned. Inochi narikeri (Even such is life) provides a valuable addition to the literature of what actually happened to kamikaze pilots who could not complete their missions and survived. A few other accounts of Army special attack pilots mention punishment when they returned to base, but this book gives no such indication although the two crewmen felt somewhat remorseful to have survived when their other squadron members had died in suicide attacks. When they finally reached Hyakurihara Air Base in Ibaraki Prefecture after returning from being stranded on Tokunoshima Island on their fourth Kamikaze Special Attack Corps sortie, the officer in charge did not punish them in any way and actually rewarded them with a night that they could spend at a local onsen (hot springs) inn at no cost in order to relax after their travails. 1. The pronunciation of his given name is not provided in the book. His name is the kanji for the common word shizuka in Japanese, and his given name may be something other than Kiyoshi.